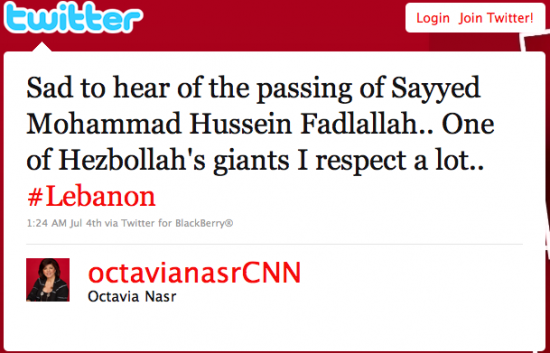 They're a militant Shiite Muslim organization defined by the U.S. government as a terrorist group, but don't tell that to CNN senior editor of Middle Eastern affairs, Octavia Nasr. The AP also reports Fadlallah is known for "his staunch anti-American stance" and is blacklisted as a terrorist by the U.S. government. But where else but CNN would you see a member of its editorial staff opening mourn the passing of a "terrorist?"